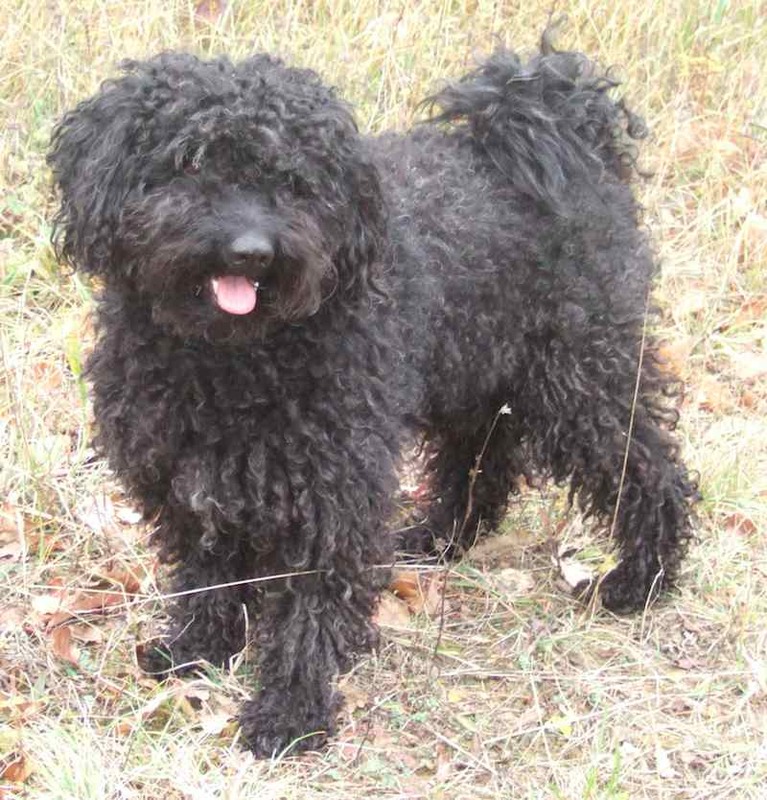 Puli (Hungarian Puli) is a medium-sized Hungarian sheepdog of Asiatic origin, and has been prized for centuries for his ability to do the strenuous work of herding the flocks of sheep, and sometimes cattle, swine, and horses, on the great plains, or Puszta, of Hungary. It follows that he must be sturdy, richly muscled, and alert, and exhibit great courage and stamina to perform his tasks. 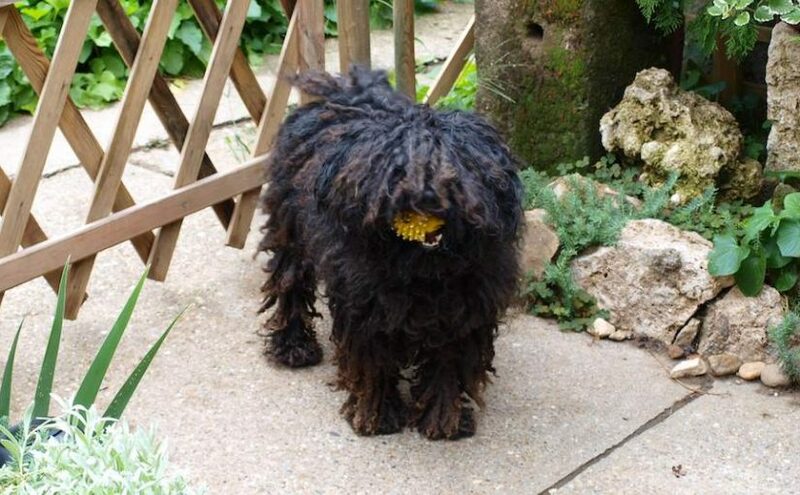 The correct mental image of the Puli should be that of a true working dog, and it is appropriate to think of him as one of the basic sheepdogs of the world. General Appearance: The most striking breed characteristic is the unusual but typical corded coat, the result of many years of natural development, adapted to outdoor living and extreme climates. There is nothing artificial in this coat; it is a unique and ancient style fitting the dog for his work. It is difficult to make an assessment of the body purely on a visual examination, for the whole dog should be covered with the profuse coat. 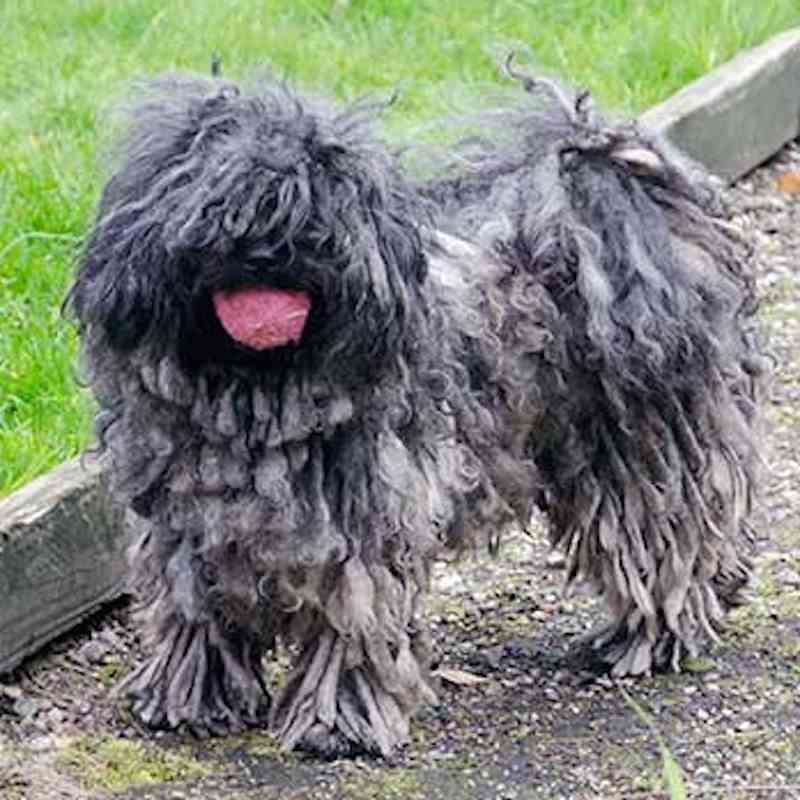 The Puli does not impress by a beautiful clean-cut shape, but by his distinctive shaggy appearance. The head appears to be round because of the long hair overshadowing the eyes, and the rump may appear to be higher due to the fullness of the tail coat. The body should be square, measured from the top of the withers to the ground, and from the foremost point of the forechest to the rear point of the pelvis, but the heavy coat may create a rectangular appearance. 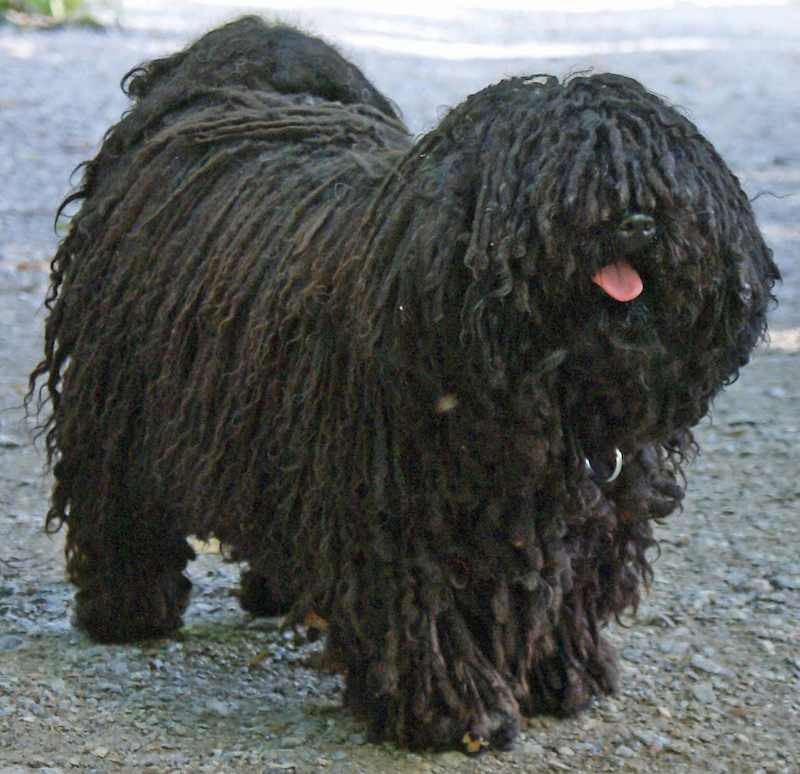 Beneath the coat, the Puli is wiry, muscular, and fine-boned, but never light or shelly. 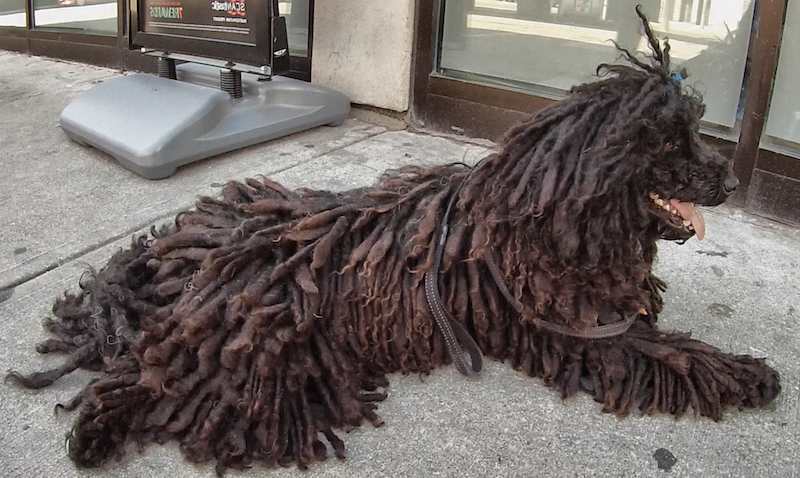 Puli Temperament: Lively, nimble, and intelligent, the Puli is by nature affectionate, and a devoted and home-loving companion, sensibly suspicious of strangers and therefore an excellent guard. He has a certain aloofness which does not lend itself to immediate and indiscriminate friendship, but extreme timidity and shyness are serious faults. Size: Height at the top of the withers – males, ideal 16-18 inches (40-46 cm); females, ideal 14-16 inches (35-41 cm). Weight – males, 28-33 lb. (13-15 kg), females, 22-28 lb. (10-13 kg). Coat and Colour: Characteristic of the breed is its dense weather-resisting double coat. The undercoat is soft, dense, and fine, and it interweaves with the topcoat, which is long, and wavy or curly, and is of a fairly coarse texture. The ideal proportions of a topcoat and undercoat create the desired cords, which consist of uniform, tightly interwoven hair. These cords are less inclined to mat together. The cords may vary from wide flat strands, to narrow flat strands, to small round cords, and these variations are all correct, provided that the coat shows the tendency to form cords. This tendency should be noticeable even in the puppy coat, the hair forming into bunches. Both puppies and young dogs will have coats of a softer texture than mature dogs, but in Pulik of all ages the tendency to cord must always be present in the coat. Cording is generally complete all over the body by the age of two years, although variations will occur. The coat should be long all over the body, the length depending on the age of the dog, and is generally longest on the hindquarters and shortest on the head and paws. With age the coat can become quite long, even reaching to the ground; however, only enough length to properly evaluate quality and texture is considered necessary so as not to penalize the working specimen or younger dog. An excess of topcoat and a sparse undercoat result in an open coat which will not cord, while too much undercoat and a sparse topcoat result in excessive matting and felting. Such coats are objectionable. A brushed-out coat is highly objectionable, as is a neglected coat. Accepted colours are: black, reddish-black, grey-reddish-black, all shades of grey, and white. The colour should always appear solid, although the greys are mostly a mixture of black and white hair, but should always look either all light, or all dark grey. A white spot on the chest of not more than 2 inches (5 cm) in diameter is permissible, and a few scattered white hairs in between the pads may be tolerated. The skin should be blue, blue-grey, or slate-grey. Head: From the front, the head should appear round, from the side almost elliptical. Disregarding the hair, the head should be rather small and fine. The skull should be smooth, moderately wide, and slightly domed, with the stop clearly defined but not abrupt. The muzzle should be straight and rather short, about one-third of the total length of the head, and should never be snipey, but bluntly rounded, ending in a relatively large nose. The upper and lower jaws should be well developed to accommodate a full set of teeth. The teeth should be large regular, and strong, with a scissors bite, the lower incisors touching the inside of the upper incisors. A level bite, the upper and lower incisors meeting edge to edge, is acceptable. The flews should fit tightly to the set of teeth, and the roof of the mouth should be uniformly dark, or variegated with deeply pigmented spots on a dark base. The arches of the eye sockets should be well defined. The eyes should be medium sized, slightly slanted with eyelids tight, and should be dark brown in colour. Their expression should be lively and intelligent. The ears should be set medium-high, pendant, and V-shaped, measuring about half the length of the head, reaching to the inner corner of the eye when pulled forward. Movement of the ears is practically imperceptible. Nose, flews, and eyelids should always be black. Head, neck, and ears should be covered with long hair which blends in with the body, not showing noticeably separate features. Neck: Should be set at an angle of 45 degrees to the horizontal, of medium length, tight and muscular, and slightly arched. It should seem to merge with the body because of the long hair. Forequarters: The shoulder blade and the upper arm should be about the same length, forming an angle of 90 degrees at the shoulder joint. The shoulder blade should be well laid back. Elbows set close to the chest. The forelegs should be muscular, and, viewed from any angle, they should be vertical. Fore pasterns should be slightly sloping. Feet should be round and tight, with a full and springy pad, dark grey in colour. Nails should be strong, and black or slate-grey. Dewclaws, if they occur, should be removed from both fore and hind legs. Body: The withers should be slightly higher than the level of the back, which should be of medium length, tight and straight. The loin should be short, broad, and tucked up. Rump slightly sloping towards the root of the tail, but this is not obvious because of the tail curling over the back. Chest should be medium-broad and deep, with well-sprung ribs reaching well back. The depth of the chest from the top of the withers to the brisket should be about 45 per cent of the dog’s height. Hindquarters: The pelvis should form an angle of 90 degrees to the femur, approximately the angle at the shoulder joint and resulting in structural balance. The stifle should be well bent, but not excessively, with hocks well developed and short. Tail: Should be of medium length, and should curl quickly well up over the back and touch the body, falling to one side or the other or curling on the midline of the back. The tail should not be noticeable because of the long hair on it mixing indistinguishably with the hair on the rump. 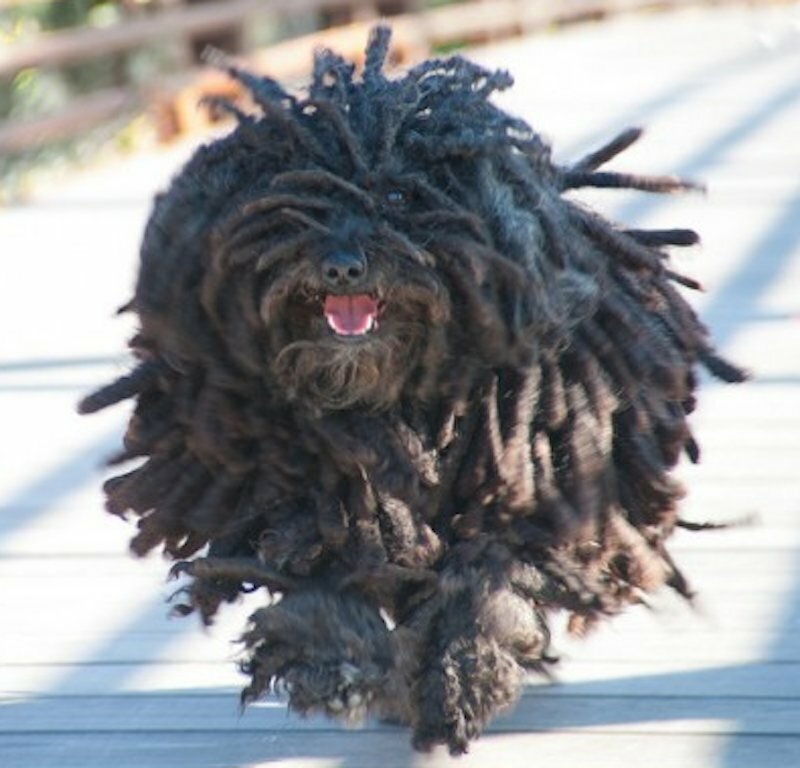 Gait: The gait of the Puli is short-striding, very quick and typical, in harmony with its lively disposition. It should never be heavy, lethargic, or lumbering. The legs should swing straight forward with no twisting in or out of the elbows, pasterns or hocks, and the feet should not interfere or cross. When at a full trot, the Puli covers ground smoothly and efficiently with good reach and drive, the feet naturally tending to converge towards a median line of travel beneath the body in order to keep the body in balance and offset pitching from side to side. The tendency to converge should never be confused with moving close, where the lower part of the legs moves parallel. The Puli should be capable of great speed and agility, and shows the unique quality of being a bundle of springs, able to leap straight up from a standstill, or to change direction suddenly in mid-air. Faults: Any departure from the foregoing should be considered a fault, the seriousness of the fault depending upon its degree. (a) Particolours. Large markings of any colour other than a white spot on the chest of not more than 2 inches (5 cm) in diameter. (b) Males under 13 inches or over 20 inches (33 and 51 cm). Females under 12 inches or over 19 inches (30 and 48 cm) respectively. (c) Colours other than those mentioned as acceptable. (d) Coats showing no tendency to form cords.